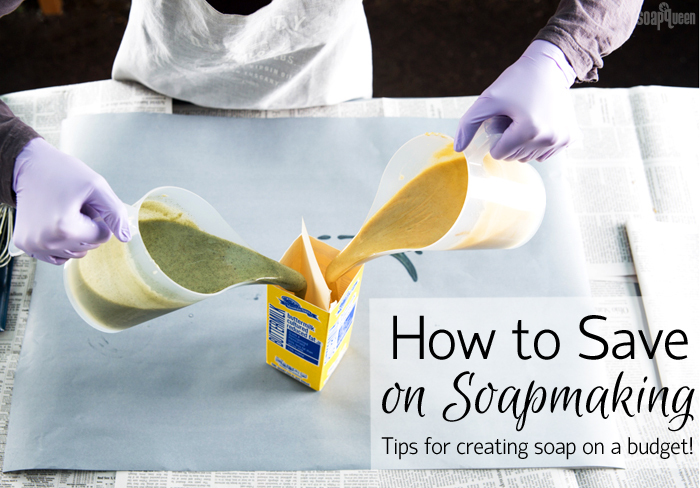 How to Save on Soapmaking: Tips for creating soap on a budget! We all have a budget. Sometimes it’s difficult to fit hobbies into that budget. Soaping is no exception; with so many fun ingredients and projects, wishlists can add up quickly. If you’re looking for ways to save on your soaping addiction, check out my tips below! Silicone and wood molds create beautiful, perfect bars. But, if you don’t particularly care about a perfect shape, molds made of recycled materials cut down on cost. 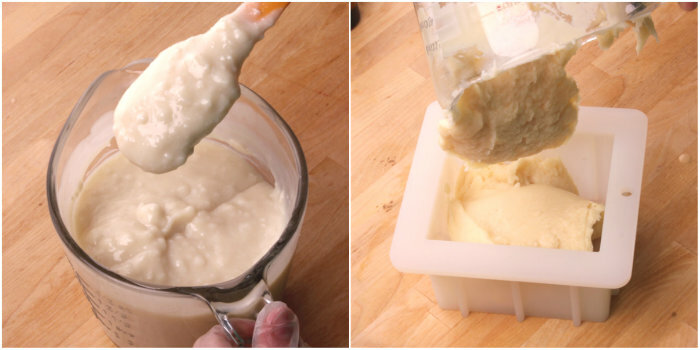 I’m a huge fan of using containers like yogurt cups and milk cartons for soap molds. Not only do they work well, they look cute and are eco-friendly. There are a few things to look for when selecting a recycled mold. Plastic containers work particularly well because they are flexible and don’t need to be lined. If choosing a non-plastic container, it will need to be lined in freezer paper. 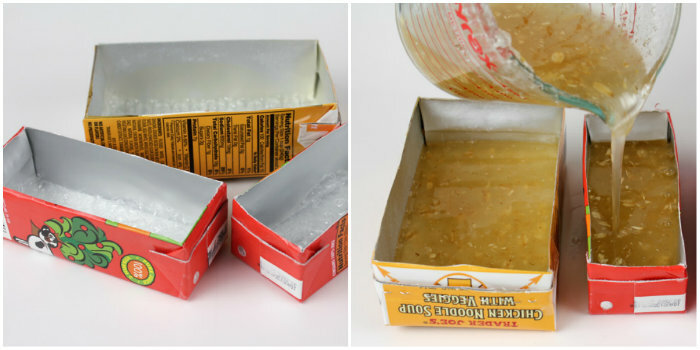 For more tips on using recycled molds, check out this post. Some soaping oils are more cost effective than others. 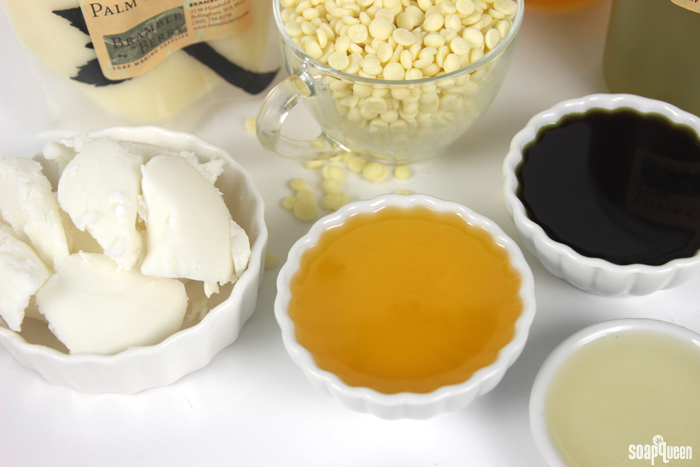 When formulating your recipe, consider the cheaper soaping oils. Some of the most cost-effective soaping oils are canola, castor, coconut, olive oil (pomace), palm oil,rice bran oil and sunflower oil. These oils still make a great bar of soap. Just remember to consider how the oil affects the final bar. For example, if you only have coconut oil on hand and don’t want to buy more oils, you’d be better off saving up to splurge on another oil. That’s because 100% coconut oil soap can be drying to skin due to its cleansing properties in soap. Click here to learn more about choosing oils for cold process recipes, and how to substitute them. Using cost effective soaping oils like canola, rice bran and coconut can save a lot! It can be tempting to experiment with new ingredients you’ve never used in soap before, and I encourage you to try new things! But if you’re on a tight budget, carefully research how to use the ingredient in soap beforehand. Soapmaking is a science, and “random” ingredients can throw off the entire batch. This is especially true with fragrance oils. Fragrance oils are made up of hundreds of synthetic ingredients. When combined with lye and oils, those ingredients can have negative reactions that may ruin your batch. Fragrances not tested in cold process soap likely won’t work. At Bramble Berry, we test hundreds of fragrance oils every year and only bring in about 5% of those oils. 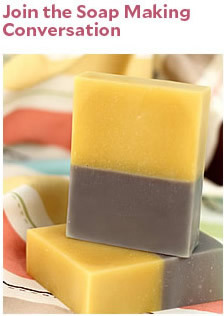 If you find a cheap fragrance oil not tested for soap, it could ruin your entire batch! Always use ingredients tested for soap for consistent results. If you’re trying a new product, or using an ingredient that is a little “iffy,” make a small test batch first. That way if you don’t love the way it works, you don’t waste a lot of soaping ingredients. I especially recommend testing new colorants and fragrance blends. I love using the 4″ Silicone Loaf Mold for test batches. It makes approximately one pound of soap, which results in about 4 bars. It’s the perfect amount to try a new recipe, and give a few bars to family or friends for feedback. Making small test batches first is a great way to find out how you like a recipe before making a huge batch and potentially “wasting” all those ingredients! We all experience soapy fails on occasion. Don’t get discouraged or beat yourself up about it. Instead, save your batch! There is almost always a way to save a failed batch of soap. Soapy fails are often caused by misbehaving fragrance oils. 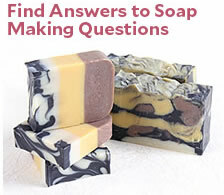 If a fragrance oil caused problems, check out Soap Behaving Badly Post to learn how to save it. A great example is the Black Cherry Bounces Back post. A mismanufactured fragrance oil caused the entire batch to separate. Luckily, we were able to “hot process hero” the batch and make usable soap. If your soap has less serious cosmetic issues like soda ash or glycerin rivers, the Soapy Mess-Up Quick Guide is full of tips. Saving a failed batch may not result in the most beautiful bar of soap, but it does make the soap usable. That way, you’re not throwing away all the ingredients and wasting money! Saving a failed batch of soap means you don’t waste the ingredients. Once you find the perfect recipe and ingredients, buying in bulk can save a lot. Yes, you have to spend more money upfront, but it saves in the long run! A great example of this is outlined in the How to Calculate the Price of Your Products post. For example, most Bramble Berry fixed oils are sold in 1 pound, 7 pound and 35 pound options. With each size increase, the cost per pound decreases. If you choose to splurge and buy the larger size, I recommend having a plan on how you’re going to use the product. That way, you don’t end up with a bunch of extra on hand. I would also consider how quickly you think you’ll use it, and avoid any products with a short shelf life if you can’t use it up before it goes rancid. Most ingredients can be swapped for others in soap and other bath and beauty recipes. To save money, purchase ingredients that you can use in more than one project or recipe. For example, lightweight liquid oils can be used in so many ways. Oils like avocado, sweet almond and sunflower can be used to disperse colorants and create a variety of products like soap, lip balm, lotion and more. Mica colorants can be used in melt and pour, lotions, bath fizzies, and sometimes cold process soap and lip balms as well. Always be sure to thoroughly read the product description to see how ingredients perform in various applications. Sometimes, you can save a little by using ingredients you may already have in your kitchen. Ingredients like paprika and cocoa powder give soap lovely colors. Oatmeal and used coffee grounds can be added to soap for texture and exfoliation. If you have leftover fruits and vegetables, they can be puréed and added to your soap at trace. 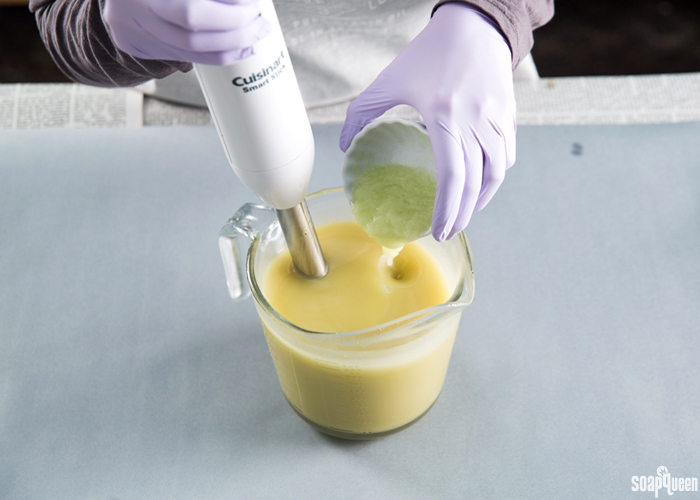 Click here to learn more about adding purees to cold process soap. Have leftover beer, wine or champagne? That can be used for soap too! Click here to learn how. Don’t let leftover fruits and veggies go to waste – use them in your soap! Most bath and body product ingredients have a shelf life. Shelf life refers to the length of time that a product can be stored without it becoming unfit for use. How you store the products can cause the shelf life to decrease, which will cause the products to become rancid faster. Most ingredients should be stored in a cool, dark and dry place. If you’d like to learn more about shelf life and rancidity, click here. Then, click here to learn how to store your products correctly. Rather than buying a bunch of random ingredients, plan your orders around your recipes. Then, add the “fun extras” after the essentials. That way, you won’t place an order and forget an essential item and need to place another. This saves on shipping! Shopping for essentials first also avoid having extra ingredients on hand that could go rancid. Don’t miss out on sales – sign up for the Bramble Berry newsletter! Looking for a coupon code, or a heads up on upcoming sales? Sign up for the Bramble Berry newsletter! We never spam your inbox, and also send out exclusive recipes and tutorials.